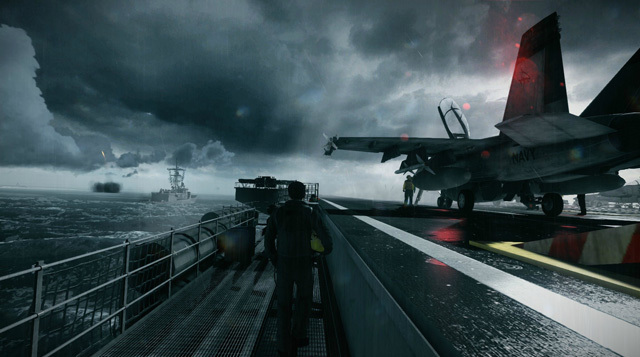 “Hell yes,” I said aloud as my character stepped onto the flight deck of an aircraft carrier. I was so ready for this. 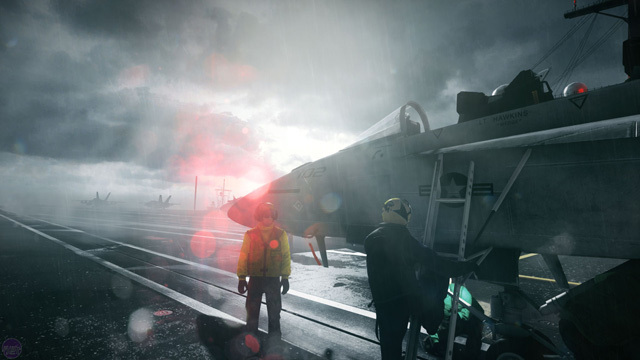 Through its first three missions, Battlefield 3‘s campaign had been a shaky ride – literally, too, as the entirety of “Uprising” can be legitimately blamed on the earthquake that closed “Operation Swordbreaker” – and the game was teetering back toward the shelf. For all the hype, for all the amazing trailers closing with the Terminator Salvation-esque take on the familiar “da-dun dun da dun-dun” Battlefield theme, this was a game that seemed to be in the midst of a major identity crisis. Battlefield was not settling for a couple million sales and “solid military shooter” acclaim – it was coming for Modern Warfare 3 and the AAA crown. No game was going to unseat Call of Duty overnight, but the Battlefield series looked ready to make its move. One of Battlefield‘s calling cards has always been its massive scale battles, which were well-represented in previous single player campaigns in the Bad Company spin-off series. While the second Bad Company game did noticeably scale back from the openness of the first, both games succeeded in creating very compelling yet open-ended gameplay experiences in sprawling (and destructible) levels. It was puzzling, then, to see the prologue mission, “Semper Fidelis,” unveil the latest iteration of DICE’s impressive Frostbite Engine in a subway car, underground, at night. Awkward hand-to-hand combat played out in confusing and slow QTEs whose button presses were more “play next scripted sequence” than “react quickly,” and an additional QTE to jump from one train car to the next just left me longing for Mirror’s Edge 2. 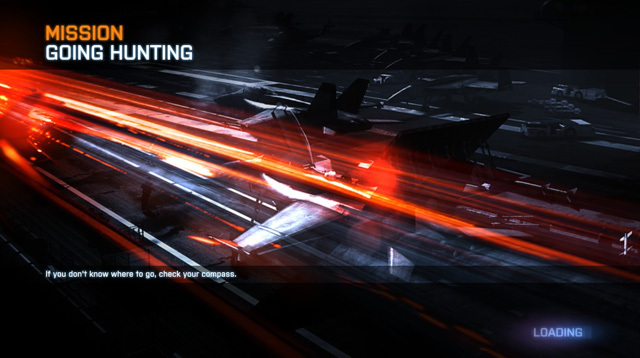 By the conclusion of Battlefield 3’s third mission, “Uprising,” I still didn’t really know what I was playing. While “Operation Swordbreaker” had shown the big-time production value and polish that “Semper Fidelis” had lacked (I submit the game should have opened on the visually stunning exit from the APC at “Swordbreaker’s” start), the subsequent “Uprising” dragged the game back under cover of darkness in the form of a pseudo-stealth level. After a few minutes of crawling through conveniently cracked rubble and surviving a life-or-death QTE with a rat, I was about ready to be done with Battlefield. That’s when the form of an F-18 appeared on the next mission’s load screen. Flight has long been another of the Battlefield series’ calling cards, with a combined air + ground experience few other games offer, let alone match (obligatory Warhawk and Starhawk shill goes here). Surely, then, “Going Hunting” would provide that first dose of Battlefield action to truly set this game apart. 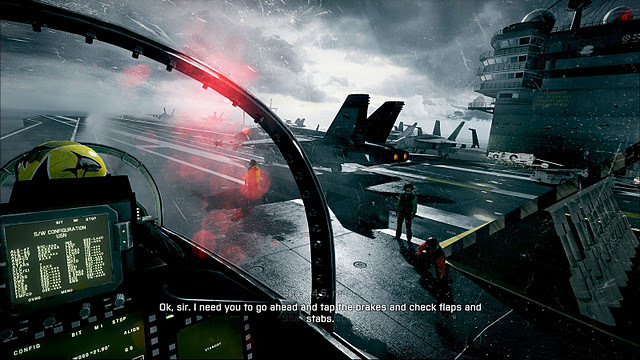 The intro is a tedious walking cutscene (but an excellently presented walking cutscene) aboard an aircraft carrier with the player character following another pilot as he gives a quick pre-flight briefing. After a brief stroll through the interior, the pilots exit to the flight deck. This may be one of the most stunning visuals of this generation of games – stormy waves crash against the carrier’s hull under ominous clouds pierced by a handful of rays of sunlight. On the horizon, a naval destroyer fires cruise missiles toward the shore. I can’t wait to fly in this. At the walking cutscene’s conclusion, the other pilot turns to say, “Okay. Let’s rock and roll,” and straps on his helmet. I’m certainly ready to rock and roll… until he climbs into the cockpit of the waiting F-18. Alas, they were not. My character plops on her helmet (she’s indeed a she, which might be neat if she had any meaningful role to play in the game) and hops up the ladder to the rear seat. It’s now time for the “flight” tutorial, which consists of looking left and right to make sure that the flaps and tail stabilizers play the correct animations when scripted to do so. Spoiler: They do. For 20 minutes, my heart sank as I begrudgingly rode along in what can only be loosely considered a “flight” mission and is perhaps the biggest sting of gaming disappointment I’d felt in years. It is no more than a rail shooter – a highly polished big-budget AAA rail shooter, no doubt, but a rail shooter nonetheless – and not a particularly good one. Your role as co-pilot is to look around, fire weapons, and deploy flares. During the dogfight phase of the level you ride a spline path, spending much of your time waiting for enemy planes to follow their spline paths. When they’re in your gun sights, you fire a completely ineffective machine gun and occasionally fire off missiles as target locks allow. When they’re behind you, you turn around and wait for them to fire a missile, at which point you press the button to drop flares. Then the enemy fighter will slowly pull up alongside you before pulling forward into your crosshairs. Repeat a dozen or so times, and scene. The level then transitions into the targeting camera for a now genre-standard thermal-vision bombing run. After painting targets for A-10 strikes, the game fades out to a first-person night-vision landing sequence back on the carrier. The interrogation room cinematic leading into the game’s next mission is the icing on the cake, with primary character Henry Blackburn retorting to his interrogators, “That’s a nice story. I don’t see how it connects.” Indeed, there is no connection. It’s never spoken of again. I suppose I should have expected as much. Big budget shooters, perhaps out of the once noble pursuit of varied and diverse gameplay, have turned to kitchen-sink bravado in the name of “the experience,” relinquishing identity and personality they once held in the process. All too often we as an industry forget that games are an interactive medium, and that its greatest moments come not from explicit authorial control, but the authoring of player stories in the scenarios we as designers have laid out for them. Sitting in the back seat of a jet on a spline and occasionally tapping the flares button isn’t compelling interaction, and it certainly isn’t Battlefield. This is what propelled Battlefield 3 “a couple million” pre-orders and that has driven the game to sales figures of over eight million as of late November 2011. This is something Call of Duty can’t possibly offer. This – closing distance, the chase, juking free of your pursuer, lining up the shot, and firing the kill shot, etc. – is pilot fantasy, not waiting 30 seconds for an enemy plane to lazily drift from behind you to in front of you while flying in a straight line. This is Battlefield. It’s understandable when the latest Medal of Honor presents a similarly well-polished Apache helicopter sequence from the gunner seat – I’m not exactly expecting a helicopter simulation from that series. It’s unforgivable when Battlefield abandons one of its signatures and shoves me into the back seat of a jet-shaped stroller. Immediately following “Going Hunting,” I ejected the disc. The next morning, I ordered Modern Warfare 3. Love it or hate it, the Call of Duty series has never been afraid to simply be Call of Duty. Battlefield 3 multiplayer isn’t afraid to be Battlefield. Battlefield 3’s campaign is, and pretends to be Call of Duty to compensate. In doing so, it leaves behind a hollow shell of a game that could have been so much more. If we’re lucky, DICE will take the training wheels off for Battlefield 4. In the meantime, I’ll be playing Modern Warfare 3. This entry was posted in Gaming and tagged battlefield, call of duty on December 29, 2011 by Andrew Weldon.